Not to be confused with Beagle Bros. The Beagle Boys are a group of fictional characters from the Donald Duck universe. Created by Carl Barks, they are a family clan of organized criminals who constantly try to rob Scrooge McDuck. Their introduction and first appearance was in Terror of the Beagle Boys (Walt Disney's Comics and Stories #134, November 1951), although in this story they only appear in the last frame and have no lines. They appear again in the next issue in a similar fashion, in The Big Bin on Killmotor Hill (Walt Disney's Comics and Stories #135, December 1951). The Beagle Boys were originally created by Carl Barks, and made their first appearance in the 10-page story The Terror of the Beagle Boys (WDC #134) that was first published in November 1951. Although the Beagle Boys are only shown very briefly on the last page of this story, it is implied that Scrooge has known about them for a long time. The Beagle Boys are usually depicted as a gang of about three to ten members or more depending on the story, who are identical in appearance and personality. They wear black bandit masks to hide their identities and on their turtleneck sweaters, most often being orange or red, they have their prison number signs. The Beagle Boys are often characterized to be very crude, boastful, aggravating, greedy and self-centered — among themselves however, they are very loyal and have a strong connection of sibling camaraderie. Although, on some occasions they have shown irritation toward each other, often relating to someone making a mistake or saying something that doesn't fit in with the consensus, like one Beagle Boy's (176-167) overly fondness of prunes, a weakness that proves to be the Beagle Boys' downfall in some stories. 176-167's love for prunes makes him the only Beagle Boy with a unique characteristic. The first story to feature the Beagle Boys in a major role is Only a Poor Old Man (Uncle Scrooge #1, March 1952), which serves as a template for virtually all future Beagle Boys appearances, and establishes them as a serious threat to Scrooge's fortune. In the same story they are called "the most awful gang of crooks in the country" by Donald Duck. This most often manifests with them cleverly coming up with various and elaborate schemes to try to break into and steal from Scrooge McDuck's well secured Money Bin. On occasion they are even shown to have highly intellectual capacities, as they are able to earn academic degrees in various fields. Among individual Beagle Boys, some of these degrees include: cranial encephalography, psychology, chemistry, metallurgy and electropyrotechnology. These were often seen by the government as attempts at rehabilitation, but in reality it was a charade by the Beagle Boys to use their newly acquired skills for robberies. They are also experts at trickery, including disguises, and animal training; like using cormorants as aerial bombers, as well as having a large arsenal of various weapons, explosives and machines. When needed, they have been shown to be able to use force or threats to get what they want. With all things considered however, the Beagle Boys are often attributed not to be as clever they think they are, often gullible to tricks and offensives themselves, and most of their appearances ends with them getting arrested. They are usually imprisoned in Duckburg prisons or Sing Sing, but they have also been jailed in other prisons as well. The Beagle Boys are however proud of their criminal background; never willing to live their lives in accordance to the law. The Beagle Boys' main goal for stealing Scrooge McDuck's money is so they can create a paradisiacal life of luxury for themselves. On few occasions when they have managed to steal the money they are shown to spend it all very wastefully and in excess; like buying extravagant and ostentatious mansions or living on a paradise island near Hawaii. They have also shown proneness for taking over the world when being presented with such an opportunity, like in Carl Barks' story The Mysterious Stone Ray (Uncle Scrooge #8, 1954). Blackheart Beagle and his three sons, from "The Fantastic River Race" (1957). The Beagle Boys are most often shown without an established leader, instead acting as a very coherent and homogeneous unit, and only gives orders between each other interchangeably when needed. However, sometimes the Beagle Boys are led by their grandfather, Blackheart Beagle, who has the prison number 186-802. The Blackheart character originates from two characters created by Carl Barks: Blackheart Beagle, a riverboat pirate from The Fantastic River Race (Uncle Scrooge goes to Disneyland #1, 1957) and Grandpa Beagle, who appeared in The Money Well (Uncle Scrooge #21, 1958). It was Don Rosa who later combined the character into one in chapters 10 and 11 of The Life and Times of Scrooge McDuck. Also according to Rosa, Blackheart Beagle semi-retired in 1947, following a failed attempt at robbing Scrooge's Money Bin. In The Life and Times of Scrooge McDuck, Scrooge first met The Beagle Boys in his Mississippi riverboat days, circa 1880. Those Beagle Boys included Blackheart Beagle and his three sons. Scrooge first met the modern third generation Beagle Boys during Christmas 1947, which was when he first met his grandnephews Huey, Dewey and Louie and met his nephew Donald Duck for the second time. Since then the Beagle Boys have been a constant threat to Scrooge's Money Bin. Grandpa Beagle from "The Money Well" (1958). The third generation of the Beagle Boys, like their fathers, were never given any personal names by Carl Barks but was instead referred to by their prison numbers, which starts with "176-" and ends on a permutation of the numbers 1, 6 and 7, which allows six different combinations. This tradition was first established in Barks' The Menehune Mystery (Uncle Scrooge #4, December 1953), while the Beagle Boys in previous stories, and some of them in The Menehune Mystery, instead had their prison numbers as "176-" followed by random digits (except in their first story, where they have no prison numbers). However, in a few of his later stories Barks didn't continue this tradition and used random numbers again instead, but subsequent writers and artists by default still mostly uses the 1, 6 and 7 combinations for the Beagle Boys in the modern comic books. The Beagle Boys also have their prison numbers tattooed on their chests. According to Don Rosa's The Beagle Boys vs. The Money Bin (2001), the Beagle Boys have been known by their prison numbers since their childhood, and they don't even know their real names themselves. Their parents do know their real names, but demand a bribe from their sons to let them know. Also according to that story, Blackheart Beagle doesn't remember his sons' names. Carl Barks used to include the words "Beagle Boys, Inc." on their shirts under their numbers, which was later deleted in reprints. It can either be assumed that it was a reference to Murder, Inc., a name for organized crime groups in the 1930s and 40s; or that they are a criminal organization very similar to a real business, but neither is certain. In one comic the Beagle Boys have a worldwide organization known as Beagles International, in which the Beagles have spies in different countries around the world. 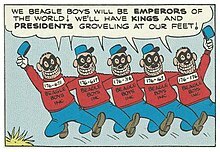 In most of Carl Barks stories the number of Beagle Boys was not exact but instead they were depicted as being ambiguously numerous, with their number of members varying from story to story. However, if one would count all of the different combinations of the Beagle Boys' prison numbers that was used in the comic books by Carl Barks; the Beagle Boys would seem to consist of at least 36 members. In The Menehune Mystery, Scrooge mentions thirty Beagle Boys. Don Rosa, however, constantly uses seven Beagle Boys in his stories but instead of using a random number Rosa always hides one prison numbers behind something to avoid two Beagle Boys having the same number. The Beagle Boys usually operate on their own, but collaborated with Magica De Spell in the 1963 Barks story Isle of the Golden Geese, and again in the 1997 Don Rosa story A Little Something Special where they also teamed up with Flintheart Glomgold. In The Status Seeker (Uncle Scrooge #41, 1963) by Carl Barks, they are shown to be part of a labor union called the "Burglars, Thugs, and Pirates Union", at Local No. 61⁄2. The Beagle Boys #3 (1966). From 1964 to 1979 the Beagle Boys had their own comic book title, The Beagle Boys, published by Gold Key Comics, which continued from 1979 to 1980 under the name The Beagle Boys Versus Uncle Scrooge. In all comics, the individual Beagle Boys are referred to by their prison numbers as per Barks's convention. In addition to Barks's and Rosa's claim that the Beagle Boys don't know their names, the Beagle Boys-centric comic Being Donald Duck (2003) by Olaf Moriarty Solstrand adds that the Beagle Boys don't know their mother's name either, only her number. The Beagle Boys' prison numbers are indicated on the tags seen on the chests of their distinctive orange or red turtleneck sweaters. The original depictions by Barks in American comics most often showed the Beagle Boys with orange sweaters. European comics recolored these same Barks drawings to show Beagle Boys in red sweaters. Subsequent European comic depictions of the Beagle Boys by artists other than Barks also showed them in red sweaters, as did the DuckTales cartoons. Grandpa Beagle as seen in the Italian comic books. In later years, especially in Europe, they appear in the comics as a trio, alongside cousins and other relatives of various talents as spin-off characters. Most notably are the Beagle Brats, the Beagle Boys' three preteen nephews created by Tony Strobl and Steve Steere in That Motherly Feeling (Walt Disney's Comics and Stories #299, 1965). They mirror criminal versions of Huey, Dewey and Louie and have the prison numbers 1, 2 and 3. Another prominent relative is Intellectual-176 (or I-176), the Beagle Boys' cousin who acts as the brains of the Beagle clan. He wears a mortar-board cap and glasses over his black bandit mask. I-176 was created by Pete Alvarado and first appeared in The Crown Jewel Job (The Beagle Boys #7, 1967). The Beagle Boys generally live in a small tumbledown hide-out in Duckburg; in 1980s American-produced stories, their pet cat Ratty often lived there as well. In the Italian stories they live in a travel trailer and are sometimes accompanied by their pet dachshund, 64, who shares their criminal mindset, but it is often overcome with 64's constant, voracious appetite. Sometimes they team up with other villains such as Magica De Spell, Black Pete, Mad Madam Mim, or hire out their services to Flintheart Glomgold, John D. Rockerduck or Jolly Ollie Eiderduck. During these occasions they continue to operate out of their own interests rather than their employers'. Many other authors use a character purely based on The Money Well version as the Beagle Boys' grandfather. In particular, Italian authors use a "Grandpa Beagle" who differs from Blackheart in being much skinnier and constantly smoking a pipe. Unlike his grandsons, he is highly intelligent and appears as their cunning and capable leader, hatching devious plans. Sometimes the Beagle Boys antagonize Super Goof, Mickey Mouse, or some other characters from Walt Disney's comic books. His favorite activity is eating sausages. Ottoperotto (which can be read as "otto per otto", meaning 8 X 8 in Italian) is the Beagle Boys' pet dachshund in Italian comic book stories. The joke about him being a dachshund is that in Italy the Beagle Boys are referred to as "Banda Bassotti", which means "Dachshund Gang". Like his masters, Ottoperotto wears a bandit mask, a shirt and a cap, marked with the number 64 (the result of the 8 x 8 multiplication). The Beagle Boys frequently take Ottoperotto along on their robberies, to act as a guard dog and to reach spaces too small for the Beagle Boys themselves. However, the plans are often spoiled by Ottoperotto's constant, voracious appetite. Whenever Ottoperotto smells food, he abandons everything else to get to eat it. The Beagle Boys made their animated debut in the 1987 Goofy short Sport Goofy in Soccermania, voiced by Will Ryan. Unlike their DuckTales incarnations, the Beagle Boys are depicted as identical in both appearance and behavior, though lacking the prison numbers of their comic counterparts. A Beagle family photo, as seen in DuckTales. From left to right: Burger, Baggy, Bouncer, Bigtime, Ma Beagle, Bugle, Bankjob, and Babyface. On DuckTales, the Beagle Boys were given names and different personalities. The usual character combination is Bigtime, Burger, and either Bouncer or Baggy, with Bouncer appearing more often in the first season and Baggy in the second. Their leader is usually Bigtime when Ma Beagle is not present. Sometimes one or two of them were swapped out with Bankjob, Babyface or Bugle, and a few episodes featured the latter three as the trio of Beagles, with Bankjob filling in for Bigtime as the leader. Other known names are Bomber and Blitzkrieg. The letter B is the first initial of all Beagle Boys' handles except Megabyte, the brains of the bunch. The Beagle Boys have lots of relatives who count each other as brothers and cousins: apart from Ma Beagle, there are re-imagined versions of the Beagle Brats (sons or nephews), as well as the Beagle Babes (a female counterpart). The Beagle Boys make cameos in the Darkwing Duck episode "In Like Blunt", where they are among the villains bidding on a list of SHUSH's secret agents. Ma Beagle, based on the real-life Ma Barker and the mystifications around her, was a new character created for DuckTales as the mother of the seven common Beagle Boys featured on the show, and the clan matriarch. She often smuggles hand grenades, chainsaws, and other tools in baked goods which easily pass prison security to help her sons escape from jail. Even when she is around, the Beagles never succeed because Scrooge McDuck and his nephews always outwit them. However, in most of the episodes she appears in (especially in the first season), she is able to avoid being arrested along with her sons; that way, she will be able to bust them out the next time she appears. In one episode, she pretended to be "married" to Scrooge so that she could steal his fortune, but her plans were thwarted by both him and his nephews. With Ma, family always comes first - except when it comes to avoiding arrest. She was voiced by actress June Foray, who also voiced Magica De Spell. Margo Martindale voices Ma in the 2017 Ducktales series. Ma Beagle first appeared in the episode "Robot Robbers", and since then she has become a recurring character. She appeared more frequently in the second season than in the first, however. Bigtime Beagle 167-671 Bigtime is the second-in-command, being the leader of the group in absence of Ma Beagle, and is distinguished by being rather short for someone with the word "Big" in his name. He is the smartest of the seven main Beagles and often has to correct his companions whenever they get something wrong and mishear his directions. Voiced by Frank Welker. Burger Beagle 761-176 or 176-761 As his name suggests, Burger has a large appetite, although it is for more than just hamburgers. He has a habit of talking about food no matter if any of the others are actually talking about it. His prison tag is often seen with a bite taken out of it. He also isn't very bright. Incidentally, his comic counterpart (who had the second placard number) is known for a special appreciation for prunes and his curious culinary tastes (i.e. catsup on ice cream or peanut butter pizza with gravy). Voiced by Chuck McCann. Bouncer Beagle 716-167 Distinguishable for his teeth, one of which is missing, Bouncer is the strongest Beagle after Bankjob. In earlier episodes before their names were well established, Bouncer sometimes had Burger's voice and vice versa. He appeared much less frequently in the third season, most likely because he was in jail as mentioned by Ma Beagle in one episode. In the GameCube version of the video game "Donald Duck Goin' Quackers! ", during the Beagle Boys boss battle, when Donald Duck fights Bigtime, Burger, and Bouncer, all three of them have the same number on Bouncer's shirt. Voiced by Chuck McCann. Baggy Beagle 617-716 Baggy is distinguishable for his silly grin as well as his loose-fitting clothing. His prison tag is often seen with a fold in one the corners. He is the least intelligent and the most sloppy of the Beagle Boys. He appeared more frequently in the second season and somewhat replaced Bouncer as third beagle in the usual trio of himself, Bigtime and Burger. Voiced by Frank Welker. Bankjob Beagle 671-167 or 614-167 Bankjob is the third-in-command of the Beagle Boys, as he usually leads the group in episodes where Bigtime isn't present. He is the largest of the seven main Beagles (by comparison, he is about the same size as Launchpad), and the strongest. In the second season he had no speaking roles and rarely appeared. Voiced by Peter Cullen. Bugle/Bebop Beagle 671-761 Bugle, or Bebop, depending on the episode, is the beatnik member of the Beagle Boys (despite the fact that the comic Beagle with this character trait corresponds by placard to Babyface), and even dresses in a jazz-styled outfit. Had no speaking roles in season two. Voiced by Brian Cummings. Babyface Beagle 176-167 As his name suggests, Babyface is the youngest of the primary Beagles, as evidenced by the fact that his own clothing matches those of a baby, including a propeller beanie in place of the usual hat. He's also rather short yet slightly taller than Bigtime. In spite of this, his voice, provided by Terry McGovern (who also voices Launchpad), sounds more manly than that of Burger. Strangely, one particular comic story in Disney Adventures prominently featured Babyface, wherein he infiltrated Webby's class. But he looked different from how he did on the show, and he also had a conscience, as he ended up rebelling against his brothers during a field trip to Scrooge's Money Bin. (He still ended up being arrested along with his brothers, though.) Like Bankjob and Bebop, his role was reduced to non-speaking cameos in the second season. Megabyte Beagle is the most intelligent engineering genius of the clan, and the only one whose name doesn't begin with the letter "B". He appeared in the five-part serial Super DuckTales, in which he made a remote control to control GizmoDuck. He has a habit of confusing his companions with his technobabble, forcing them to make him "say it in Beagle talk!". Ma Beagle comments that paying his college fees with stolen money paid off. His voice was done by Frank Welker. Bomber Beagle looks a lot like Bankjob in that he has a similar jawline and is very large. He appears in less episodes and is more intelligent than most of the other brothers. He is also a skilled pilot as seen in the episode "Top Duck" (episode 16). Backwoods Beagle is a small beagle about the size of Bigtime and Babyface, and the only Beagle who wears a full moustache. He has a strong Canadian accent and is the twin brother of Binky Beagle and Bacon Beagle. Backwoods wears a Davy Crocket-like trapper's outfit as opposed to the normal jailhouse outfit of the Beagleboys. He is also the only person who is able to understand Bacon Beagle. Binky Beagle is a probably the only Beagle Boy who is never seen speaking. He is roughly the same size as Baggy Beagle, wears a lumberjack outfit and has a full beard. He lives with Backwoods and Bacon Beagle in the Ducky Mountains. Bacon Beagle is the only Beagle Boy who is not a Beagle. Bacon is in fact a pig. When Glomgold asked how he could be a Beagle Boy, Backwoods explains that Bacon had a bad case of the swine flu as a child. Bacon cannot speak, but his oinks and grunts are, instead, translated by Backwoods Beagle. In the 2017 reboot series, the Beagle Boys are divided into several smaller gangs as revealed in the episode "The Beagle Birthday Massacre!" and are all voiced by Eric Bauza. The Original Classics – The Original Classics consist of Bigtime, Burger, and Bouncer Beagle. They debut in the episode "Daytrip of Doom!" This series' version of Burger Beagle departs drastically from his original series' counterpart in being tall and skinny. The Glam Yankees – A trio of rock-themed Beagle Boys. The Déjà Vus – A trio of French themed Beagle Boys; their name provides a gag in the episode "The Beagle Birthday Massacre", as they are introduced by Ma Beagle three times, similar to real world Déjà vu. The 6th Avenue Meanies – A trio of thuggish, brutish Beagle Boys led by Bad Attitude Beagle. The 6th Avenue Friendlies – A trio of well-mannered, dapper Beagle Boys led by Benevolent Beagle. The Longboard Taquitos – A trio of daredevil Beagle Boys who ride on skateboards and wear wing-suits. The Tumblebums – A trio of Gothic circus Beagle Boys, consisting of a muscular clown, a stilt-walker, and an acrobat. The Ugly Failures – A trio of unattractive and incompetent Beagle Boys consisting of Botched Job, Bungle, and Bottle Beagle. Black Arts Beagle – A solo Beagle Boy who is a stage magician and who differs from the other Beagle Boys by having gray fur instead of tan. Broadway and Backfield Beagle - Two Beagle Boys introduced in the DuckTales comics with a movie director and football theme, respectively. Bomber and Butcher Beagle - Two hockey playing Beagles that are also introduced in the DuckTales comics. Grandpappy Beagle - Ma Beagle's grandfather who most notably stole the deed to Duckburg before Scrooge stole it from him and crashed the first annual McDuck Enterprises Christmas Party. Grandpappy's Gang - A trio of Beagle Boys consisting of Bankjob, Babyface, and Bugle Beagle. The Beagle Boys appeared as Pete's henchmen in the film Mickey, Donald, Goofy: The Three Musketeers. There are only three Beagle Boys in the film, one of them noted for being short (however unlike BigTime he wasn't the leader but more or less the "idiot" of the group), with gray skin and black hoods. They decide to depose Princess Minnie so Pete could become king. They were shown as much more competent and dangerous compared to their DuckTales counterparts. These Beagle Boys were collectively voiced by Jeff Bennett and Maurice LaMarche. These versions of the Beagle Boys appear in the video game Kingdom Hearts 3D: Dream Drop Distance. ^ "The Mysterious Stone Ray". coa.inducks.org. Retrieved 2016-05-11. ^ "The Giant Robot Robbers". coa.inducks.org. Retrieved 2016-05-11. ^ "House of Haunts". coa.inducks.org. Retrieved 2016-05-10. ^ "Only A Poor Old Man". coa.inducks.org. Retrieved 2016-05-11. ^ "The Twenty-four Carat Moon". coa.inducks.org. Retrieved 2016-05-11. ^ "The Case of the Sticky Money". coa.inducks.org. Retrieved 2016-05-11. ^ "The Menehune Mystery". coa.inducks.org. Retrieved 2016-05-11. ^ "The Recluse Of McDuck Manor". coa.inducks.org. Retrieved 2016-05-10. ^ "The Case of the Sticky Money". coa.inducks.org. Retrieved 2016-05-10. ^ "Carl Barks". coa.inducks.org. Retrieved 2016-03-08.